An age old question. Which came first. Chicken? Egg? And really, does it matter? Except to those who live off the grants that fund the studies to decide the issue for once and all? The more serious query concerns chicken nuggets. So, which came first the white meat or the batter? The answer, of course, is neither. But the surprise that American children will eat deep-fried chicken goo is interesting. Any North American parent could have told Jamie the outcome in advance. We train our kids to eat chicken nuggets as early as possible. Their ability to gnaw the soggy glop apart is the key to our semi-liberation. No longer are we a slave to our own dinner tables once Junior can subsist on nuggets and french fries (can’t forget the starch – it’s staple). Once the eating of fried chicken paste is mastered. We are free to feed our kids on the run courtesy of McDonald’s, who will let us choose apples or carrots to assuage our guilt and throw in a plastic Chinese toy for added distraction time. Chicken nuggets means we can eat out again. 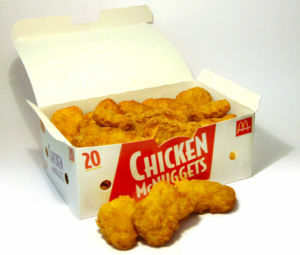 Not at good restaurants – because their “nuggets” are actually “fingers” which our children eye with suspicion (having no personal knowledge of what real chicken looks like). They sniff. They poke. They balk. They take a bite or two and refuse to eat more because “it tastes different”. Different being a bad thing where small barely cognizant humans are concerned. By the time they are the age of the kids in this “fool-proof” experiment, they are ruined. It baffles me to see how much kids love chicken nuggets, but then my daughter’s been vegetarian since birth and would no more eat a nugget than she would a live chicken. Don’t get me wrong, she’s consumed her share of Pop-Tarts and other dietary abominations, but nuggets are one thing that isn’t even on her radar.